Of all the wonderful companies that Silk Street are proud to call our friends and partners, one particularly stands out for its ingenuity… Proseccart. 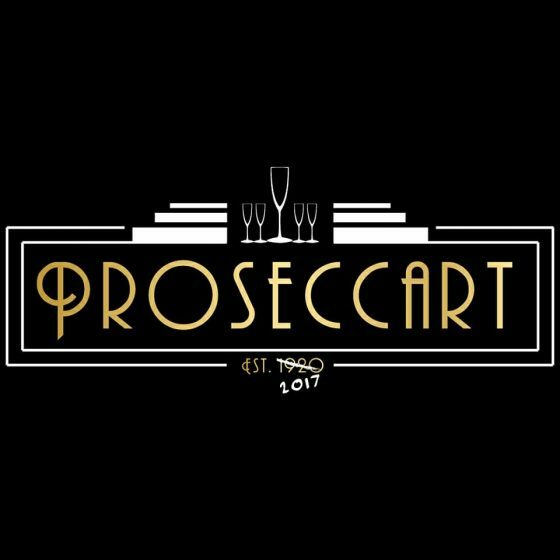 You see Proseccart, brainchild of Stace and Ish, are the fellas behind the UK’s only walk-on-board Prosecco bar with Art Deco features. We love how the logo has ‘Established 1920’ crossed out hastily with a scrawled ‘2017’ underneath. Proseccart is a young company with a love of the vintage. That, of course, puts them right up The Jazz Spivs’ street. Shrewdly noticing that good fizz is sometimes hard to find at events – and combining this observation with a shared passion for renovating all things old, Stace and Ish had soon painstakingly restored a vintage horse cart – not just to its former glory – but something above and beyond that in the shape of their very own mobile Prosecco bar. With the cart fitted out with period style ceiling lamps, a reclaimed handmade bar with illuminated glass front and various over 1920s touches, the mobile bar fittingly combines Prosecco and cart. Hence the name – Proseccart. The cart is available for any event, from weddings to carnivals to corporate events. In fact, any sort of party or celebration where you might like to drink a Prosecco or Prosecco-based cocktail and the cart will fit in just fine, bringing lots of fizz to the proceedings. Always open to suggestions and always happy to tailor packages to suit the needs of customers and their specific needs, Proseccart will always oblige. Just get in touch for a chat! So, if you’re planning a 1920s, prohibition or speakeasy theme for your event The Jazz Spivs are the ideal act to bring some Gatsby-style glitz an authentic jazz sounds to the party. As 1920s jazz band hire goes, you’ll be hard pushed to beat The Jazz Spivs, but that can be arranged when you add-on with a Proseccart booking. When you book with the fellas, there’s also the option to book the Flapper Girls or Silk Street Jazz. So, don’t just put on the Ritz, put on the fizz too with Proseccart!